The Sennyu Goggles is headgear in Splatoon 2. It is a 3-star item produced by Forge and comes with the primary ability Ink Resistance Up. It is only available as a CoroCoro Comic promotion in Japan. It cannot be ordered through Murch. 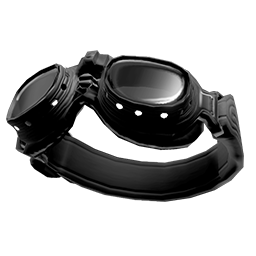 The Sennyu Goggles are a large pair of black matte goggles with a dark black strap. They have clear lenses and a ring of small holes around each lens. They are worn on the forehead, rather than over the eyes. The Sennyu Goggles comes with Ink Resistance Up as a main ability. As a 3-star item, the Sennyu Goggles has three additional slots for secondary abilities. Since it is made by the Forge brand, it has a higher chance of rolling Special Power Up and a lower chance of rolling Ink Saver (Sub) to fill its secondary ability slots. The Sennyu Goggles has a similar look of the Pilot Goggles and are both 3-star items. Goggles of the Splatoon manga wears the Sennyu Goggles during the events of Octo Expansion. This page was last edited on 25 October 2018, at 17:09.